Requires Virtual Memory to be enabled, regardless of how much RAM the game has access to. SecuROM 7.40 DRM, unlimited activations. Unofficial Patch #5 can be downloaded from Mod DB. This features a number of fixes and is highly recommended. To install the patch, download it and extract it into the FUEL installation folder, then follow the instructions provided in that page (select "Read more..."). Players using the Steam version and using either Patch #5 or #4 may have the error about "Disc not found". They can use Patch #3 instead. 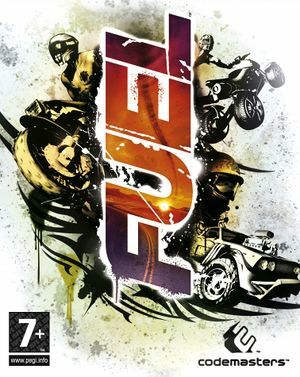 The FUEL: REFUELED 2013.1 [R2] mod adds a selection of improvements to the game, including improved AI, UI, graphics options and more. To install the mod, download it from Mod DB, extract it into the FUEL installation folder and then follow the instructions provided in that page (select "Read more..."). Use the -W command line argument. To launch game from Steam, follow this guide. Broken on modern systems, but it can be forced using the video card's control panel. It can be forced using D3DOverrider. Open VehicleParam.java with a text editor. VehiclePP 512, 513 and 514 control the camera FOV for the widest/most zoomed out view. 512 is the closest value when the vehicle is stationary, and the other values control the FOV as the vehicle accelerates. VehiclePP 545, 546, 547 works in the same way but is the closest view. VehiclePP 413, 414 and 415 is the internal view. Camera pitch/height is controlled by 542 and 544. If one of them is increased, the other has to be as well to flatten it out. Distance is controlled by 539. The values near this range alter various similar stuff too, they are replicated for each camera. So 542 would be closest view, and would be 410 (for internal view) etc. ↑ 2.0 2.1 File/folder structure within this directory reflects the path(s) listed for Windows and/or Steam game data (use Wine regedit to access Windows registry paths). Games with Steam Cloud support may store data in ~/.steam/steam/userdata/<user-id>/12800/ in addition to or instead of this directory. The app ID (12800) may differ in some cases. Treat backslashes as forward slashes. See the glossary page for details.